Go for a trip up to the Blue Mountains or just go to the Zoo. How does sailing on Sydney Harbour sound or just spend the day at Bondi Beach. Isn’t it something that we can do all these amazing things so easily. Drive for an hour and a half, go up a hill, turn left into Katoomba, follow the signs to Echo Point and the Three Sisters, look around for a park then gape at the view. It’s just incredible that a place like the Three Sisters can exist so close to a city the size of Sydney. Don’t Look at the Three Sisters! You might be debating with yourself whether you can afford a whole day or more to visit the mountains. To make the idea a little more attractive include a little wildlife. Stop on route at the Featherdale Wildlife Park. Featherdale boasts a full range of Aussie critters including koalas, wombats, kangaroos, emus, dingoes, reptiles and a large number of birds. A must see is the beautiful Wentworth Falls. Why not take the opportunity to enjoy a little bushwalk around the falls. Walks can take as little as 60 minutes or several hours depending upon your starting point. Be well prepared if you intend going on a long walk and ideally let someone know where you are going. Visitors do get lost in the mountains but you’re too smart (you’re reading this so you must be 🙂 ) for that to happen to you. There is much to see and experience in the Blue Mountains. Wentworth Falls, train ride down a cliff (the excellent Scenic Railway), Skyway Cable Car, Grand Canyon, Federal Pass and many other great walks and a lot of great Blue Mountain lookouts to look out from. Once you’ve ‘done’ the Three Sisters visit the Blue Mountains Tourist Information Centre in Katoomba. They are a very helpful and friendly bunch. Are the Blue Mountains really Blue? On a hazy day the Blue Mountains may earn their name, perhaps. The official explanation is that fine droplets of aromatic oil released by the eucalypt trees refract the sunlight making the mountains appear blue from a distance. Whilst on the subject of the weather, if it’s cloudy be patient as it may just blow away. If the weather has set in consider a trip to Jenolan Caves. The Bells Line of Road to the North is my preferred route in and out of the mountains. Stop at the Botanical Gardens and Bellbird Lookout (see below) for nice views back into town. Consider taking the Kurmond Road towards Freemans Reach to avoid Richmond and Windsor and a few traffic lights (potentially cheap petrol at the BP Station just before the turn off). 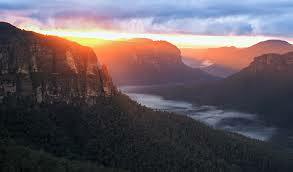 Follow the link below for more about the Blue Mountains. Everybody loves the zoo, well maybe some of the lions might look a little fed up with it but most humans seem to enjoy it. 🙂 Taronga Zoo also boasts classic views across Sydney Harbour including the Sydney Opera House and Harbour Bridge. Catch the ferry from Circular Quay to make the journey part of the experience. Anything less than a dozen pictures with the Opera House and Sydney Harbour Bridge in the background and you are just not trying. 🙂 There is a cable car leading from the ferry wharf to the zoo or you can bus your way up the hill. The facilities at Taronga Zoo are surprisingly good with a number of food options from traditional fast food to the pleasant Tree Tops cafe with excellent, if partially obscured, views of Sydney Harbour. We have been quietly encouraging Taronga Zoo to introduce a family friendly pass or flexible ticket for years. They are now giving a modest discount for families which is a step in the right direction. All we need now is a short-day pass that caters for return trips and we will shut up. If enough people ask for short-day, return pass they might introduce one. You may find Taronga Zoo Do’s and Don’ts particularly useful if you have kids. Bondi Beach, used to be thought as the ‘People’s Beach’, a place of freedom. So as you might expect, it is home to a diverse crowd and Bondi can get crowded at times. Most people just aim for the beach to relax and maybe have a go at body surfing. If you have no inclination to get wet, you can just stroll on, or alongside, the beach and browse the shops on the other side of the road. When it’s open, the Bondi Pavilion Balcony is a neat place to watch the waves, wavers and the other people passing by. There is a bar upstairs allowing you to take drinks out onto the balcony. The Bondi Pavilion also hosts exhibits and plays, particularly during the Sydney Festival. Some are fun, and some aren’t, but they are often short and you can take your drinks in with you.